"The IFPG Retreat was the best event ever. We had a great time with all the IFPG Consultants. Thank you for such a fantastic retreat!" "IFPG hit it out of the park. 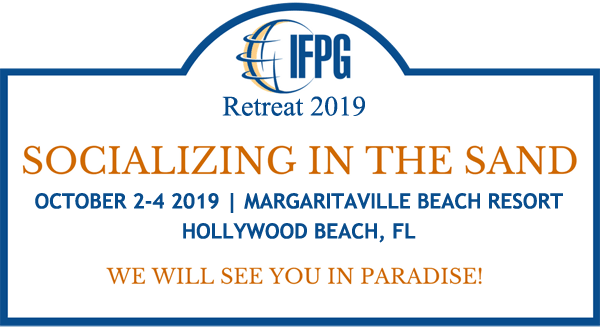 The IFPG Retreat was the best organized event with a very different and welcomed atmosphere, complete with an exceptional positive vibe enjoyed by consultants, franchisors, and vendors alike. IFPG delivered an unusual new business intimacy that produced fantastic new dialogue among all attendees, such as the round-table discussions and one-on-one consultant/franchisor/vendor presentations, and yes, an over-the-top party cruise! I was amazed at how everyone seemed more engaged and sharing information, ideas, suggestions, and offering help and assistance to make IFPG the standout group in our industry!" Contact Kelly Falkena-Tominus at 888-977-4374 ext 107 for more details and registration information. Contact Amy Comerford at 888-977-4374 ext 111 for more details and registration information.